As with most social engineering legislation, the Americans with Disabilities Act (ADA) was enacted with the best of intentions. Passed in 1990, one of the primary objectives of the ADA was to assure disabled citizens access to public places and private businesses – and that’s a good thing. But to accomplish this ambitious objective, the infamous Title III public accommodation section piled up sweeping regulations regarding parking, curb height, service counters, signage and the size of restrooms. If you own a building, lease office space or operate a business that serves the public, there is some component of your life touched by ADA Title III. In terms of interpretation and implementation, the ADA was a mixed blessing from the beginning. Although it has undoubtedly accomplished a lot of what it was intended to do, it has also caused hardship for landlords and businesses when regulations were enforced too aggressively or applied unevenly. But as unsatisfactory as ADA enforcement can be, no one could have anticipated something worse: a juggernaut of sham ADA lawsuits plaguing businesses of all types. With increasingly regularity, these so-called drive-by lawsuits are filed against individuals or organization on behalf of questionable plaintiffs whose sole interest is collecting a settlement. 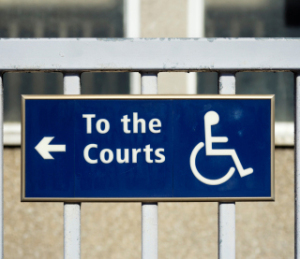 Typically, this litigation is initiated by disabled individuals who visit a building specifically to identify a “violation” and bring a bogus lawsuit. This particular class of plaintiffs is usually associated with a legal team that specializes in this kind of litigation. And anyone who has been around the block a few times – and particularly small strip centers – understands that the ADA provision that allows a prevailing plaintiff to recover attorney fees is part of the attraction. For the drive-by filers, this is a business. It is typical for these individuals to file multiple lawsuits, especially against restaurants, bars, retailers and particularly small businesses that may not have the resources to fight the lawsuit. In many cases, the defendant is unaware of the violation, if indeed it exists at all. You may not have time to monitor these changes, but the people who are waiting to sue you have all the time and motivation in the world. Because ADA regulations apply so broadly, it is not hard to find opportunities. ADA Title III is all about access, so any physical barrier to easy entry to a facility or any part of it could be construed as a violation of a disabled person’s right under the ADA. And if you think your building or business might be grandfathered in, think again. It isn’t. The ADA does not acknowledge the possibility of that defense. You should further understand that you will not be given the opportunity to remedy any alleged violation, real or imagined. The objective of these lawsuits is not to improve access for disabled people. It is rather to improve the financial status of a small number of scamsters and their lawyers. Most people’s visceral reaction to these scams is outrage, but has that has not deterred drive-by ADA lawsuits. This particular blight on the legal landscape is becoming more common by the day. So just because you haven’t been hit with a drive-by lawsuit yet doesn’t mean you won’t be in the future. If you are the target of a drive-by ADA lawsuit, you have two choices: settle or fight. The plaintiffs who bring these suits are experienced in creating financial scenarios that make it tempting to settle. Depending on the situation, you may indeed conclude that settlement is your best option. However, if you choose to fight, there are strategies that have proven successful against drive-by lawsuits. The most common defense involves challenging the “standing” of the plaintiff. In addition to actually being disabled, the law requires that plaintiffs can prove they were planning on returning to the property. Given the nature of these plaintiffs, a bit of background research will often reveal clear evidence to the contrary. Ultimately, the best defense against bogus ADA lawsuits is to not be involved in them at all. That requires taking steps to make sure that your property is ADA lawsuit-proofed in advance. You don’t have to figure this out for yourself: there are reputable consultants, architects and attorneys who are able to provide guidance. As part of this process, it makes sense to investigate the status of your business insurance and the particulars of your lease. Insurance companies are generally averse to paying out claims to fraudsters. But the ADA has always been tricky legal terrain, one best negotiated with an experienced guide. For example, ADA Accessibility Guidelines are updated every few years, so a building you believe to be in compliance may not be as the guidelines change. You may not have time to monitor these changes, but the people who are waiting to sue you have all the time and motivation in the world.